The luxurious five-star Abalone House & Spa effortlessly blends old world elegance with eclectic decadence in the quaint seaside village of Paternoster on the Cape West Coast. Situated 160km north of Cape Town, Paternoster has its own distinctive beauty, with its unspoilt shimmering white beaches, rocky outcrops, turquoise waters of the Atlantic and indigenous fynbos. Whitewashed fishermen’s houses, blue shutters, colourful fishing boats scattered on the beach and boat masts tinkling in the breeze create an idyllic setting for this unique Boutique Hotel. A 90-minute drive from Cape Town, Abalone House & Spa offers city-weary dwellers and discerning travellers an unashamedly opulent beachside escape, where extravagance and guest comforts take precedence. Set amid indigenous gardens, an air of quirky decadence pervades this sophisticated haven with its ten luxurious suites. 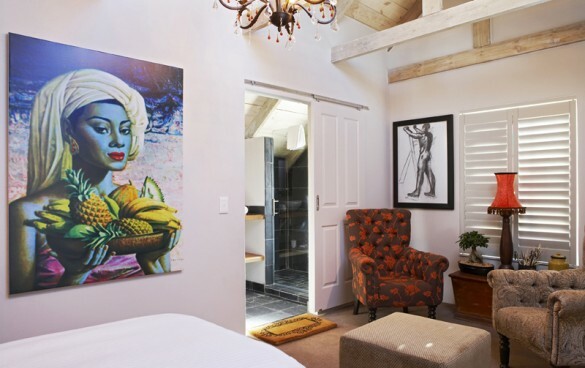 Lavishly designed with luxurious bohemian decor by Cape Town interior designer David Strauss, Abalone House & Spa delights with its grandeur, eclectic visual tapestry and divine cuisine. Flamboyant layers of lived-in luxury include lovingly restored antiques, treasured memorabilia and objets d’art from the owner’s personal collection that share the welcoming spaces beside crystal chandeliers, wooden ceilings, modern furnishings and old silverware. 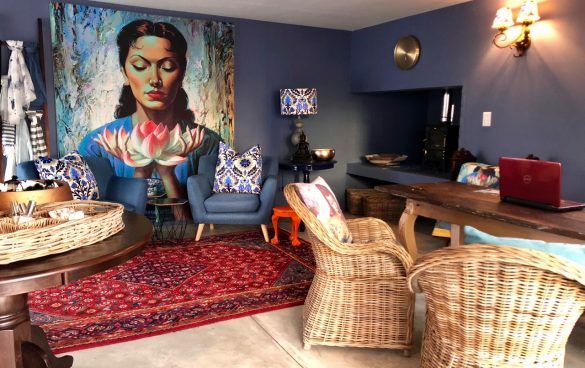 Inspired by the vibrant works of Artist Vladimir Tretchikoff, every area of this West Coast Boutique Guesthouse reflects an elegant opulence, with French-style doors and richly hued Persian rugs adorning stone floors. The signature Tretchikoff wall prints make a playfully eccentric style statement amid a flurry of jewel coloured fabrics, furnishings and African ornaments. Abalone House & Spa is also the perfect place for small conferences and intimate weddings. The outside areas of Abalone House & Spa have their own seaside appeal reminiscent of the Greek isles, with wooden walkways and decking, comfortable wicker furniture, umbrellas and potted plants. There’s even a Jacuzzi on the rooftop deck. With its unhindered views of the beaches of Paternoster, it’s the perfect spot to enjoy sundowners or a midnight dip. A charming garden courtyard – complete with antique birdcages, wind chimes and pond – surround the swimming pool. If it’s a sunny afternoon, the place to be is on the brand new deck: bask in the sun while drinking in the fresh sea air and glorious sea views. The fishing village and more than seven kilometres of pristine white beaches are just a stroll away. For more information about the Abalone Pool Villas, please click here. Please take note that Abalone House & Spa has two resident house cats; Trixie and Chelsea. We take every precaution to ensure that these beloved pets do not disturb our guests’ stay. Also note that we do permit small dogs (on a leash) to accompany visitors to our restaurant, however guests are expected to dine on the deck. Please contact us for further information. If you yearn for seaside serenity and a luxuriously comfortable place to escape to, Abalone House & Spa is just 90 minutes drive from Cape Town. Whether you are looking for a quirky hideaway, an intimate conference venue or an elegant place to host a small wedding celebration, you’ll go far to beat the five-star charm of Abalone House & Spa. 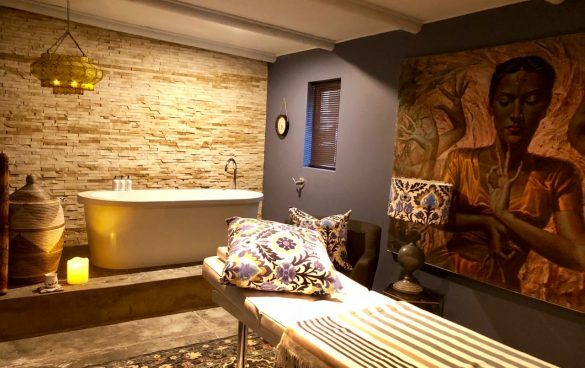 Situated in the picturesque coastal village of Paternoster on the Cape West Coast, Abalone House makes guests feel pampered and totally at home. Luxury accommodation in ten suites that caters for every indulgence, decadent decor and four areas to relax, socialise over drinks or savour delightful culinary feasts – what more could you ask for. Abalone House’s inviting public areas are filled with beautiful antiques, vibrant colours and quirky decorative finishes. The Spa at Abalone House reopened in mid September 2018 following a stylish revamp. The Spa, which boasts a new range of Africology Treatments, is now open for bookings. Read more about the new Spa under the SPA tab. What makes Abalone House special? Accommodation in one of ten sumptuous suites, some with sea views or private relaxing spaces. Socialise and swop tall stories around the oversized fireplace in the African Lounge. Enjoy a cocktail, glass of red or a tumbler of one of the top single malt whiskies and brandies on offer in the Restaurant. Languish over breakfast, lunch or afternoon tea in the sun-splashed Restaurant. Indulge in a decadent dinner in the Restaurant with its comfortable wicker chairs and crystal chandeliers. Bask in the sun while drinking in the fresh sea air and glorious sea views from the deck leading off the Restaurant at Abalone House. Cool off in the elegant plunge pool or take it easy in the sunny sheltered garden courtyard. Spoil yourself with a pampering treatment at the Spa. Enjoy a glass of French champagne amid Jacuzzi bubbles on the wooden roof deck overlooking the sea. Peruse the books and DVD’s in the well-stocked library that doubles as a small conference room. Abalone House & Spa is also eco-friendly wherever possible. That means we use solar power to heat water, recycle all kitchen refuse and keep water to a minimum. Abalone House & Spa grows its own herbs. Abalone House & Spa in the seaside village of Paternoster on the Cape West Coast boasts ten luxury ground and first-floor suites built around a tranquil sheltered garden courtyard. 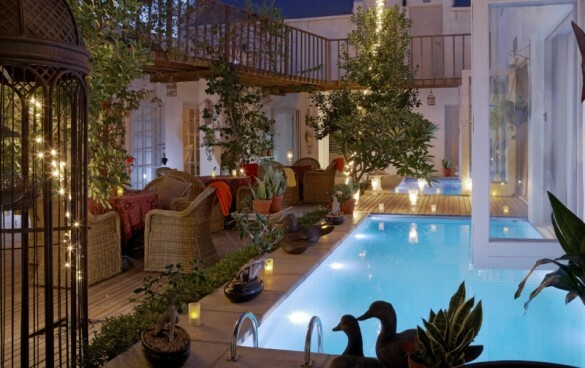 All the ground floor suites have direct access to the elegant pool set in the courtyard. In line with international trends for small boutique hotels, visitors to Abalone House are able to choose from three different types of suites, all comfortable and superbly appointed. At Abalone House, we have taken pampering to a new intensity by embellishing our suites with every conceivable convenience to ensure your comfort and enjoyment. Experience our unsurpassed attention to detail in the many thoughtful touches, from extra-length beds and deluxe pillows, to fluffy mohair blankets and under floor heating. Standard Superior: These five rooms are situated on both the ground and first floor. They do not have sea views. Luxury Superior: Situated on both the ground and first floor, these four suites have private balconies or garden patios. Some have limited sea views. Superior Sea View Suite: This magnificent suite is situated on the first floor and has its own private patio with spectacular full views of the sea. Extra length King sized or twin beds with white cotton linen. En-suite bathrooms with bath, shower, under tile heating and heated towel rails. A fully stocked bar fridge and top of the range Italian coffee machine. Flat screen TV, iPod docking station, CD and DVD player make lazing in the privacy of your suite a pleasure. In addition to the comfortable communal spaces, guests to Abalone House & Spa can enjoy the peaceful outdoor courtyard and the roof deck with Jacuzzi offering magnificent ocean views. Child Policy: Regrettably we do not allow children under the age of 12. From Cape Town: Travel north on the R27, turn left at the Vredenburg turn-off and travel through Vredenburg to Paternoster. The entire trip is ± 140km. From Cape Town International Airport: Travel towards Cape Town on the N2, take the N7 – Malmesbury/ Goodwood turnoff (Vanguard Drive) and turn right towards Malmesbury. Travel north on the N7 and turn left at the Melkbosstrand turn-off. Continue to the R27. Turn right onto the R27 and travel north, past Yzerfontein and Langebaan until you get to the Vredenburg turn-off. Turn left at the Vredenburg turn-off and travel through Vredenburg to Paternoster. The entire trip is ± 155km. Activities to do while staying at the Abalone House & Spa. Browse in Paternoster’s quaint bric a brac shops. Experience creativity unfolding with a visit to Paternoster’s art galleries and pottery studio. Stroll along eight kilometres of pristine white beach. Don’t miss out on a taste of local culture by sampling some of Paternoster’s local specialties such as pickled mussels, sun dried snoek biltong or salty ‘bokkoms’ (dried harder). Wait with the seagulls on the sun-bleached boulders for the fishermen’s boats to return with their daily catch to the village harbour. Hike or take a 4×4 route in the nearby pristine natural wilderness of the 263-hectare Cape Columbine Nature Reserve at Tietiesbaai. The reserve, about 5km from Paternoster, has many charming rocky coves along the coastline. Take a sea kayak on an ocean adventure to view the marine life dolphins, seals and whales that enter the bay in season. A must-have experience is the magnificent wild flower displays every spring (between August and September/October). If you’re a birding enthusiast, seize the opportunity to view over 200 species in the area, including African penguins, egrets, Cape Cormorants, Arctic terns and endangered black oystercatchers. Go kite surfing, snorkeling or scuba diving. Horse riding as well as mountain- and quad biking activities are also available. Remember to check beforehand as all outdoor activities on the West Coast are always weather dependent. Go on a tour of the neighbouring vineyards on the West Coast Wine Route. Buy a few bottles of select wine to enjoy back at your cottage. Request a picnic basket and experience Tietiesbaai a few kilometers outside Paternoster (part of the Columbine Nature reserve). This is also a great place to collect handfuls of shells as a reminder of your trip. Visit South Africa’s last remaining manned lighthouse in the Cape Columbine Nature Reserve. Built in 1936, the light from this marine beacon shines 32 nautical miles (60km) out to sea. Explore the scenic country villages of the Swartland area, known for its undulating wheat fields and farmlands. Walk among the beautiful indigenous coastal fynbos in the West Coast National Park Walk in Langebaan (about 45km away). The Restaurant at the five-star boutique hotel, Abalone House & Spa, offers an atmosphere of pure relaxation and sensual enjoyment. The in-house Restaurant at Abalone House is perfect for delicious meals, from breakfast to lunches and dinners. Comfortable and welcoming wicker chairs, wooden ceiling beams, chandeliers and Persian carpets set the scene for an intimate and delicious dinner. Making the most of the West Coast setting, the menu includes a selection of seafood inspired cuisine. Sublime desserts such as the West Coast African Trio (Chocolate Truffels, Almond Vanilla Ice Cream served with an Espresso and Voorkamer Pot Still brandy) are a perfect sweet ending. Breakfast is included for guests who stay at Abalone House. The vibey Bar is ideal for socialising over cocktails, wine, French champagne or one of the single malt whiskies and brandies on offer. The Restaurant is open for lunch and dinner to both Abalone House & Spa residents and members of the public, but because it is such a popular venue, make a reservation beforehand to enjoy this sumptuous cuisine! If it’s a sunny afternoon, the place to be is on the deck: bask in the late afternoon sun while drinking in the fresh sea air and glorious sea views. If privacy tops your menu, you can always opt to enjoy a light lunch and cocktails if your suite at Abalone House & Spa has its own private balcony or patio. The West Coast and brandy are not exactly unacquainted; in fact, they go together like Paternoster and crayfish. What the West Coast hasn’t experienced to any significant extent, however, is a combination of fine brandy, local food and sumptuous living. And who better to present this glorious lifestyle fusion than five-star Paternoster boutique hotel Abalone House and Spa? A food and brandy pairing menu, as well as a range of brandy-inspired cocktails, is available at the Restaurant at Abalone House. Featured cocktails include the Bojito, Brandle, Brandy Bull, Brandy in the Bos and Franklin, and will be based on some of South Africa’s top-ranked popular and artisanal potstill brandies. Please note although Abalone House does not allow children under 12, we do cater to children in the restaurant strictly during lunch service. Unfortunately we do not permit children during dinner service. Elegant simplicity is also found in the new Spa at Abalone House, which offers four calm treatment rooms – one customized for couples. The Spa, which reopened on 14 September 2018 following a stylish revamp, present guests of the boutique hotel with a new environment that continues the eclectic charm of Abalone House. Now boasting Africology products and an enticing menu of face and body treatments, the beautifully soothing surroundings will ensure a deeply enjoyable experience. You can reach the spa by calling 022 752 2044 and ask to be put through to the spa. Abalone House & Spa is the ideal setting for small conferences, executive breakaways and teambuilding workshops. 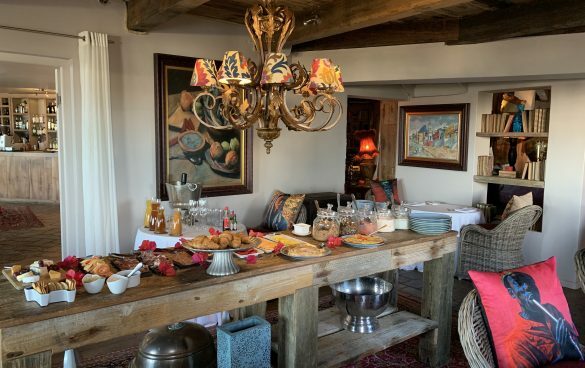 Situated 90 minutes from Cape Town – in the charming West Coast fishing village of Paternoster – the owners of this opulent five-star Guesthouse have geared the establishment to enhance every aspect of your small conference or teambuilding get- together. From superb accommodation in ten magnificent suites, to extravagant dining and quality conference facilities in a plush boardroom, Abalone House & Spa will offer your guests an indulgent, luxurious stay. 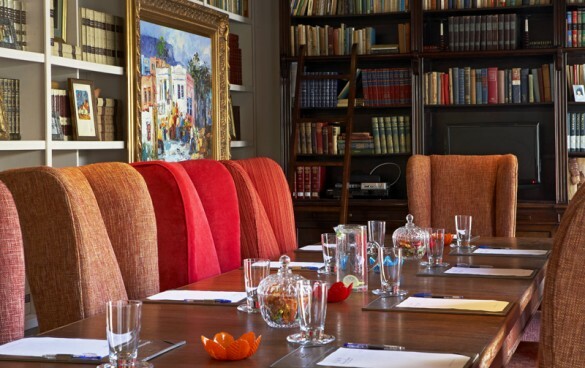 The Boutique Hotel can host between 10-14 guests for conferences depending on venue choice. Additional accommodation for guests is available at the Abalone Pool Villas nearby. In addition, Abalone House has its own small business centre offering additional internet access for guests. The boardroom looks out onto a tranquil courtyard garden where the delegates can relax after finishing off the day’s session. What makes Abalone House different from other conference venues is peaceful West Coast location combined with it unashamedly decadent Bohemian decor. Here, modern furnishings blend easily with thick Persian rugs and antiques and warm hues enhance stone floors. Old silverware and treasured objets d’art find their niche alongside vibrant artwork; feather fringed lamps and crystal chandeliers. Wooden ceilings and oversized fireplaces dominate central areas and dance with warmth in winter. There is even a rooftop Jacuzzi with a spectacular sea view to unwind after the day’s activities, while many of the suites have their own private relaxing spaces. Guests can also cool off in the courtyard pool before enjoying a cocktail in the vibey Bar. Abalone House & Spa is able to offer special menus for conference delegates, including adding afternoon tea and gourmet dinners to our basic conference packages. In addition, our staff will happily assist in devising a tailor-made conference or workshop package to include special activities such as scuba diving, kayaking, pottery and other excursions in the area. E-mail us on conference@southofafrica.co.za to find out how we can make your next small conference or executive workshop be remembered long after the event itself! If you have always dreamed of an intimate beach wedding where you and your guests are treated to a memorable five star experience, the Abalone House Boutique Hotel offers this and much more in a charming seaside setting. Situated within the charming fishing village of Paternoster on the Cape West Coast, the opulent Abalone House will ensure every aspect of your special day is extravagant, indulgent and unforgettable. Here you can turn a smaller wedding from a one-day occasion into an intimate weekend celebration with family and friends! Ideal for stylish destination weddings, Abalone House can host between 20-40 guests depending on venue choice. Abalone House boasts ten magnificent luxury suites, designed around a tranquil, central courtyard. Additional accommodation for guests is available at the 5-star Abalone Pool Villas in Paternoster. What sets Abalone House apart is its unashamedly decadent Bohemian designer decor. Here, modern furnishings blend easily with antiques and Persian rugs, deep jewel tones enhance stone floors and vibrant artwork while old silverware finds its place alongside crystal chandeliers, objets d’art and feather fringed lamps. Wooden ceilings and huge fireplaces dominate central areas and dance with warmth in winter. Abalone House gives credit to the talented photographers whose images are displayed in the gallery above. Below are links to their websites with extensive galleries of each glamorous affair. 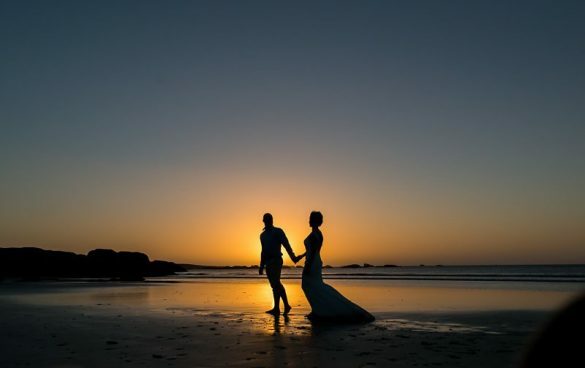 • The exquisite white beaches of Paternoster are just a few minutes’ walk from Abalone House and form the ideal background for a romantic outdoor beachside wedding next to the Atlantic Ocean. • The Restaurant with its opulent furnishings, rich colours and crystal chandeliers can seat between 20-40 guests. • The tranquil garden courtyard with potted plants and a pool offers a sheltered space for your wedding celebration. Summer is the ideal time to plan a beach wedding, especially during the warm months of February, March and April. With its Mediterranean climate, the Cape West Coast does not often have rain in summer, as the days are dry and hot. Guest comfort always tops the list at Abalone House, but for the wedding couple, we’ll take the pampering even further with gorgeous champagne, chocolates and other homely luxuries. Abalone House even has a rooftop Jacuzzi overlooking the sea, where your wedding guests can relax, or the VIP couple can enjoy romantic cocktail sundowners for two. The Executive Chef at Abalone House will gladly discuss mouth-watering menu options to enhance the day, while our team of professionals can assist with arranging a wedding ceremony on the beach, or advise on the myriad other arrangements. Wedding guests will also be eligible for a discounted accommodation rate in both Abalone House and the Abalone Pool Villas. E-mail us at weddings@abalonehouse.co.za to discuss how we can make your day exceptional. Why choose Abalone House for your wedding? 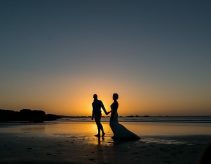 • Just 90 minutes from Cape Town in the quaint West Coast fishing village of Paternoster, Abalone House is perfect for a smaller destination wedding. • This welcoming Boutique Hotel has loads of ambience to enhance an intimate wedding of between 20-40 people. • Ten superb suites with additional accommodation for guests in the nearby selection of South of Africa self-catering cottages. • Striking backdrops, artwork and stylish interiors ensure a truly memorable wedding album. • The opulently furnished Restaurant is a luxurious reception venue for 20-40 people. • Our rooftop Jacuzzi offers another relaxing space for the romantic honeymoon couple to enjoy cocktails or French champagne. • Exquisite chef-inspired cuisine, using the best local fresh produce to create dishes and delight your guests. * Please note that the Complimentary Night for the Wedding Couple is subject to the entire Abalone House booked for your weddings. Terms and Conditions apply. Visit your favourite South of Africa property to see our Last Minute Online Deals. Click on the BOOK NOW button to view our best available rates or call 014 004 0131.